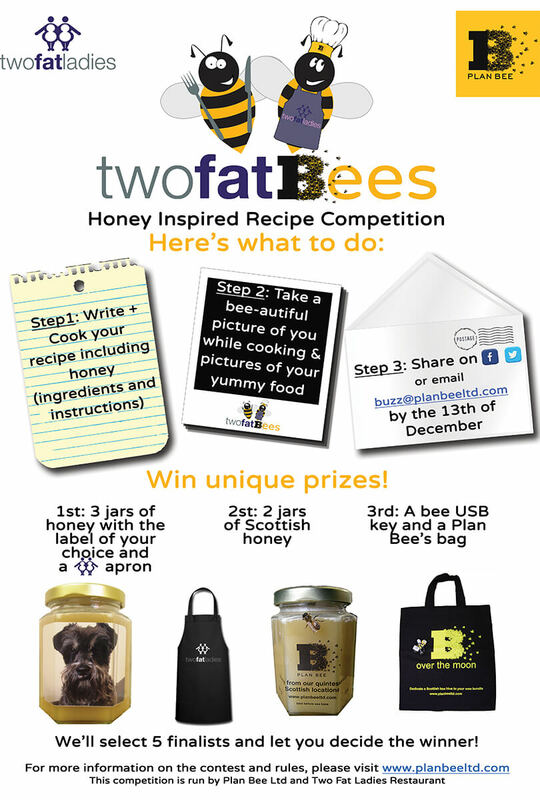 Home » Archive by Category "Plan Bee Competitions"
A lot of people think that honey can be only used on porridge or cereals, on toast or in smoothies. However, honey is more than a natural sweetener; it is also a great ingredient which can add depth to your recipes, break up accumulated fats, fight against bacteria and give a unique delicious flavour to any dish! 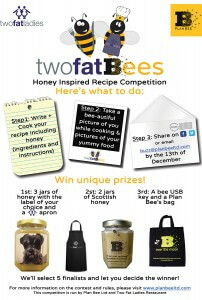 Working in partnership with the Two Fat Ladies Restaurant, who adopted two buzzing beehives managed by Plan Bee for their roof top, we have launched a honey inspired recipe competition to promote the plight of the humble honey bee and urban bees, and for you to win prizes for Christmas: Two Fat Bees Competition! We’ll select 5 finalists and let you decide the winner! For more information on the rules, please visit this page. Please don’t hesitate to contact us if you have any questions regarding the contest.